US President Donald Trump walked out of the meeting with top Democrats on Wednesday, Senate Minority Leader Chuck Schumer said, after they vowed to not approve funding for a wall on the US-Mexico border. Shumer said He asked (House) Speaker (Nancy) Pelosi, 'Will you agree to my wall?' She said no." Again, we saw a temper tantrum because he couldn't get his way." On Twitter, Trump described the meeting as a "total waste of time", underscoring his demands for a wall on the southern border. "I asked what is going to happen in 30 days if I quickly open things up, are you going to approve Border Security which includes a Wall or Steel Barrier? Nancy said, NO. I said bye-bye, nothing else works!" Trump wrote on Twitter. Earlier on Wednesday, US Vice President Mike Pence said that the Trump administration was "determined to stand firm" in its push to secure more than $5bn in funding for a wall along the border with Mexico to end what he called a "humanitarian crisis". "President Trump and I, and our entire team, are determined to stand firm until the Democrats in Congress come to the table and work with us to secure the border, build a wall, end this humanitarian crisis and do what's right for the American people," Pence said in an interview with syndicated radio show host Rush Limbaugh. The comments came on the 19th day of a partial government shutdown, which is centred on Trump's demand for $5.7bn in funding for the wall. More than 800,000 federal workers have been furloughed or required to work without pay and services have been also disrupted for many other Americans. 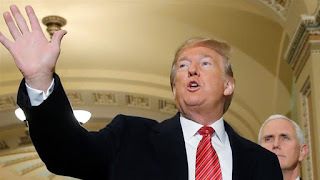 On Tuesday, Trump gave a televised address in which he made the case for a border wall, saying the situation is a "humanitarian crisis - a crisis of the heart and a crisis of the soul". Pelosi and Schumer responded, accusing Trump of appealing to "fear, not facts". Democrats oppose the border wall, calling it ineffective, expensive and immoral. After taking control of the House of Representatives last week, they passed a two-bill spending package that included more than $1.3bn for border security measures that do not include a wall. Senate Majority Leader Mitch McConnell, a Republican, has so far this year refused to bring any legislation Trump won't sign to a vote. McConnell faces increasing pressure from within his party, especially from vulnerable Republicans up for re-election in 2020, as several conservative senators urged action to reopen the government.